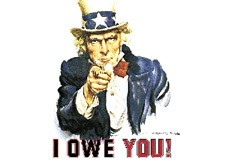 Instead Of A State Income-Tax Refund Check - An IOU? How would you feel if you checked your mail, expecting to find your state income-tax refund, but instead found an IOU from the state? This is the situation that many Californians may find themselves facing in 2009. Not only do Californians have to deal with a plummeting real estate market and uncertain job market, but now they might have to wait for their tax refunds? This is one of the alternatives that is available to California if they can't close a growing budget gap. The state is running out of cash due to an inability to agree on a budget. This wouldn't be the first time that this has happened in California. In 1992, the state government was unable to agree on a budget and many residents were issued IOUs instead of their income tax checks. It is expected that many more residents would be issued IOUs this time around. California is apparently working on a design for these IOUs, but nothing has been finalized as of yet, as they are still hoping that they won't need to use them. Interest would be paid on the IOUs, but an interest amount has not been determined as of yet either. The state also points out that taxpayers will not be able to pay THEIR debt to the government with IOUs. One thing is for sure - California is a complete mess right now.